I am pleased to announce that I was once again included in the 2018 version of Virginia Super Lawyers magazine. And make no mistake about it, it is indeed an honor — according to Superlawyers.com, no more than 5% of the lawyers licensed in a state can recieve this honor. Moreover, being selected and listed one year does not by any means guarantee selection in later years. This is my fifth year being named to Super Lawyers magazine; for two years before that I was included in the Rising Stars section based on my age. Super Lawyers, a Thomson Reuters business, is a rating service of outstanding lawyers from more than 70 practice areas. Lawyers included have attained a high degree of peer recognition and professional achievement. The annual selections are made using a patented multiphase process. The process includes a statewide survey of lawyers, an independent research evaluation of candidates and peer reviews by practice area. The result is a credible, comprehensive and diverse listing of exceptional attorneys. Super Lawyers lists are published nationwide in Super Lawyers Magazines and in leading city and regional magazines and newspapers across the country. 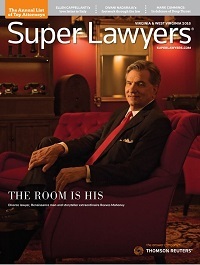 Super Lawyers Magazines also feature editorial profiles of attorneys who embody excellence in the practice of law.